We are still in the rental house. I have no complaints as its a nice house, we have great neighbors, and we can take our time finding the perfect home for our family. I do miss having a home to decorate though. I get my fix by pinning ideas for the next house, completing little projects that I can take with me when we move, and decorating for the holidays. 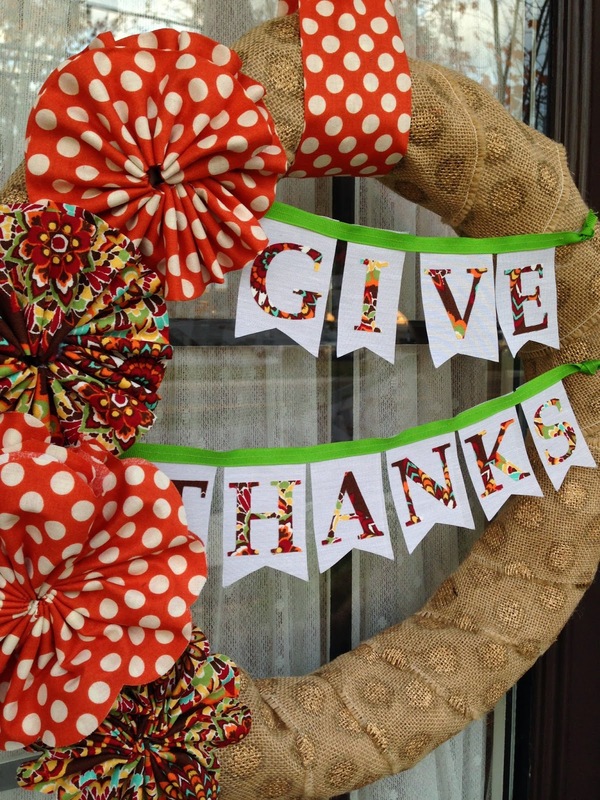 Normally I don't do much between Halloween and Christmas, but this year I've decided to do a little decorating and crafting for Thanksgiving. 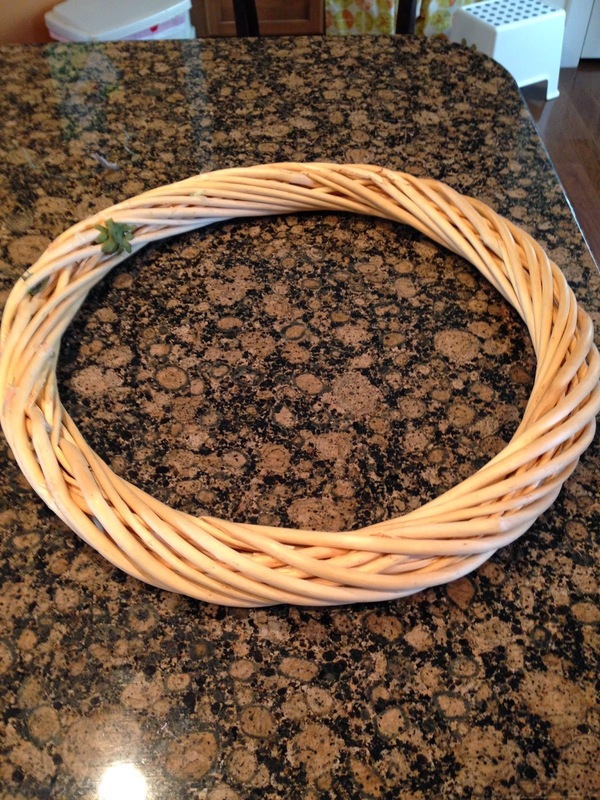 This week I tackled making a Thanksgiving wreath. 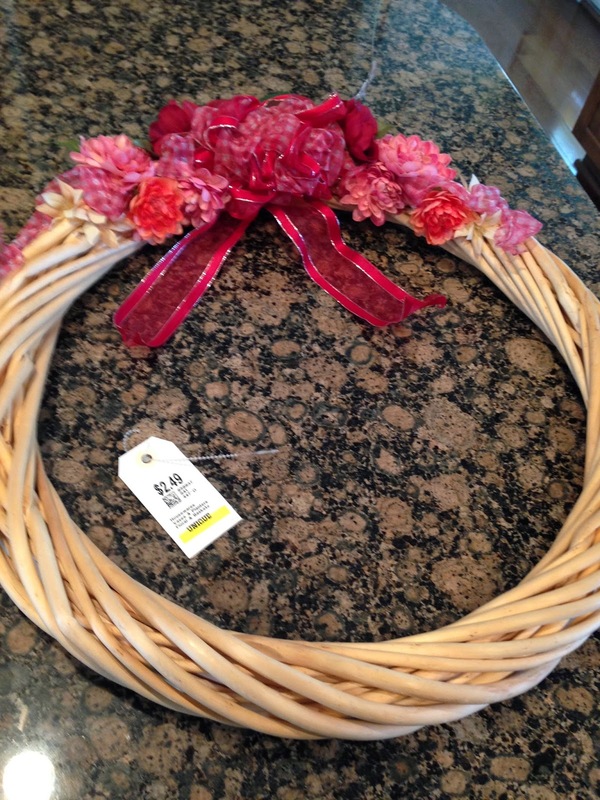 I didn't want to spend much on the wreath so I went to one of my favorite thrift stores in search of supplies and I found this beauty. It took only a few minutes to remove the ribbon and silk flowers. Note the $2.49 price, and it was an additional 25% off - so it was actually $1.87. I wanted the wreath to be a little bit thicker so I wrapped it in strips of medium weight batting I had leftover from another project. 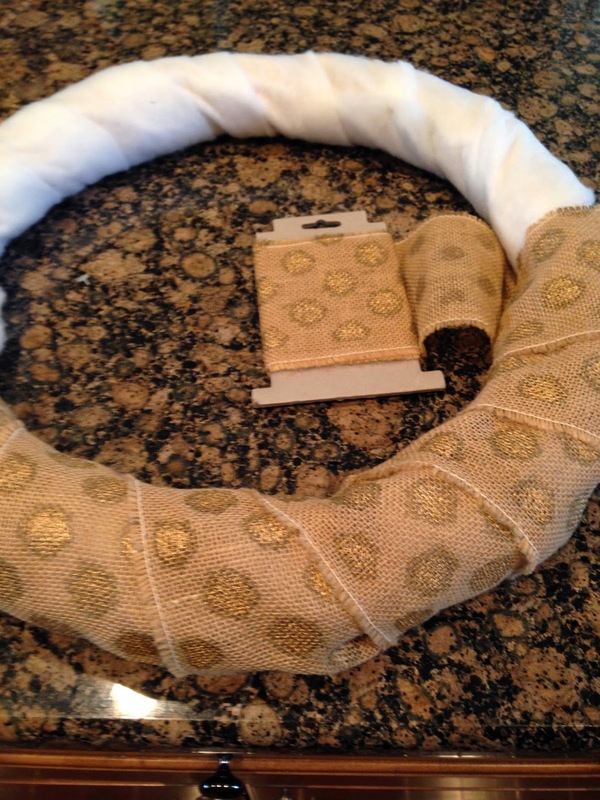 Next I wrapped it with a gold polka dotted burlap ribbon that was on clearance at Joann's for $1.97. I bought 2 packs. 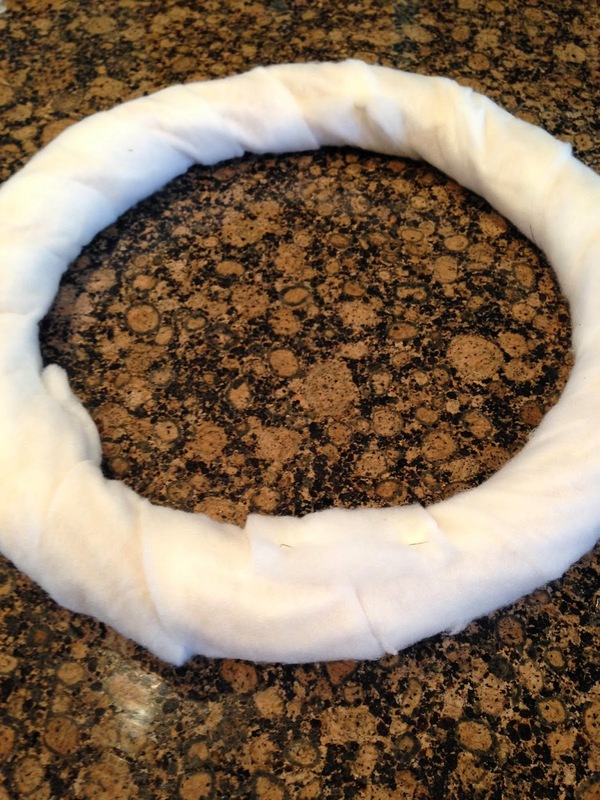 When one spool of ribbon ran out I attached it to the other with staples (on the backside of the wreath). I did the same for the end of the ribbon. I purchased 1 yard of fabric (1/2 yard of each print) to make the flowers and banner. I used this very easy technique to make the flowers. I made three flowers in a variety of sizes of each fabric. I cut a scalloped edge on a couple of them before gathering them for a slightly different look. I attached the flowers to scraps of cardboard, which made them easier to arrange before attaching them to the wreath. I ended up only using 4 on the wreath. I have plans for the left over flowers. I used my Silhouette Cameo to cut out the fabric letters (backed with Heat-N-Bond) and ironed them on to hand cut scraps of curtain liner fabric. I sewed them to the ribbon to create the banners. You could also glue them to the ribbon if you don't sew. 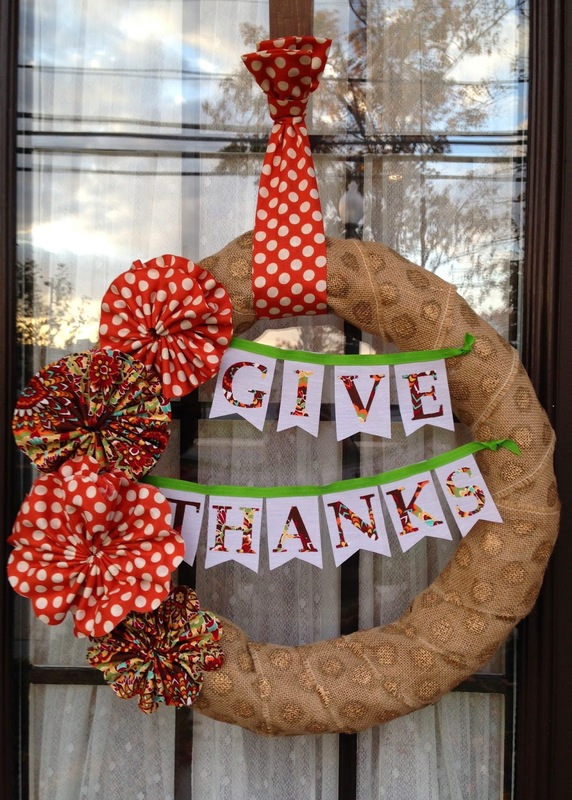 I knotted the ribbon at the ends and used hot glue to attach it to the wreath. For approximately $12 I'm very happy with the way my wreath turned out. 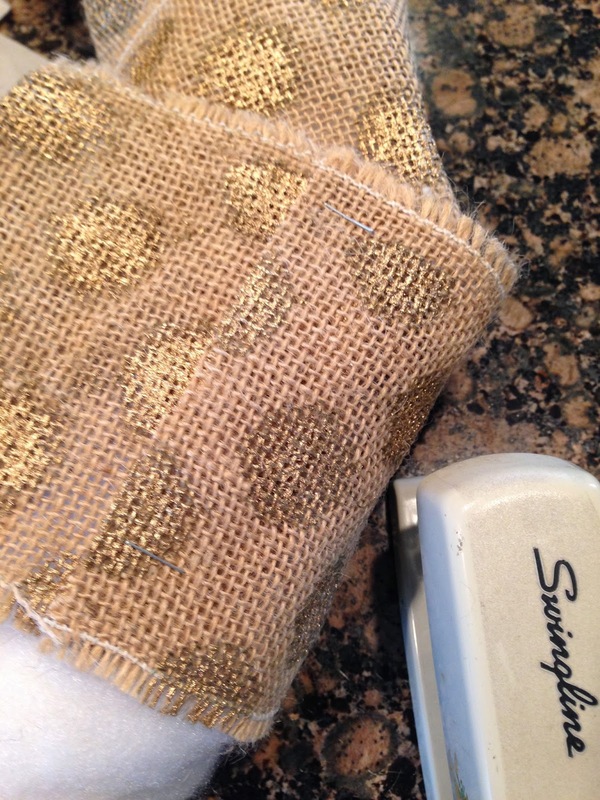 Follow me on Instagram @mandyfarn for project sneak peeks and other fun that doesn't always make it to the blog. LOVE this! Especially the fabric for the flowers!